In developing your woodwork creation, you have so far: developed ideas into a strong concept to be made with beautiful wood, researched design, construction, skills, and tools, and used mock-ups to work out various issues. Is it time to make sawdust? Not yet. You should first build the project on paper or CAD with measured drawings. Drafting the project allows you to work through the specifics of the construction and create an invaluable guide to keep you on course in making the piece. If this step is neglected, if you “wing it,” the odds are high of coming to an impasse in the course of building the project. It is better to use an eraser now than to add to the firewood pile later. Though the drawing process will include plenty of erasing/deleting, backtracking, more work with the mock-up, and some tedium, it is worth it. Orthographic projection drawings – front elevation, side elevation, and plan views – are the most practical and useful of the pencil-and-paper methods. These are made to scale for the piece as a whole. It is helpful to draw certain key areas full size, especially to work out joinery and other details. It is generally not necessary to codify all of the innards of a piece with a pretty drawing, but it is not wise to leave things to chance and risk getting stuck in the middle of a project. The drawings also serve to plan the wood requirements, and are a record that may be referred to for future projects. For the wall mirror, the example piece for this series, pictured below are front and side elevations and two modified plan views. 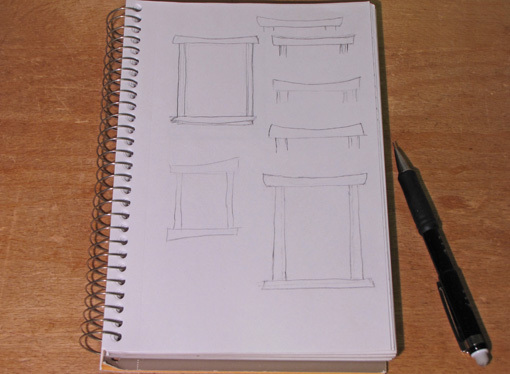 While it is possible to do some simpler and/or very familiar constructions working from a mock-up without drawings, I believe a woodworker should at least have basic drafting skills. The methods are far beyond the scope of the present discussion. 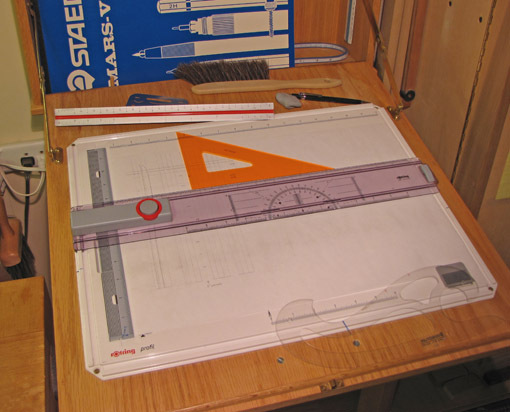 I suggest Bob Lang’s Drafting and Design for Woodworkers as a manual for understanding and making drawings, as well to get going on SketchUp 3-D CAD. 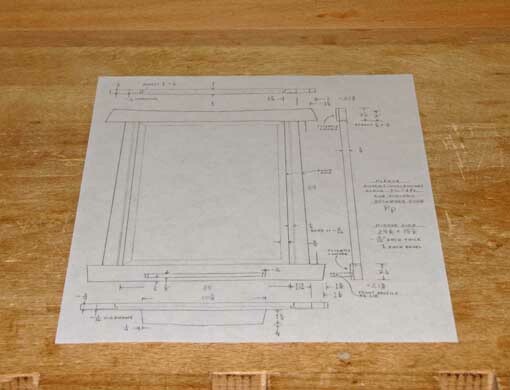 Bob now has an extensive set of video lessons, SketchUp for Woodworkers. A word of context is in order. Valuable though they are, drawings and CAD are never more than graphic representations of a piece and cannot fully define it. They do not contain the workmanship and subtle personal details, such as refined edges and textures, that contribute immeasurably to a piece. This is part of the life that a craftsman imbues into the piece as he works. And so you must build the piece, which is the subject of the next installment in the series. A design on paper or a monitor can never move us like the presence of the real object. It isn’t a work in wood without the wood. Sometimes a special piece of wood is the genesis of a project, sometimes it follows the design, but either way, the choice of wood is never an afterthought. It goes hand in hand with the design. I never get past the first idea or sketch without considering what woods might bring them to life. 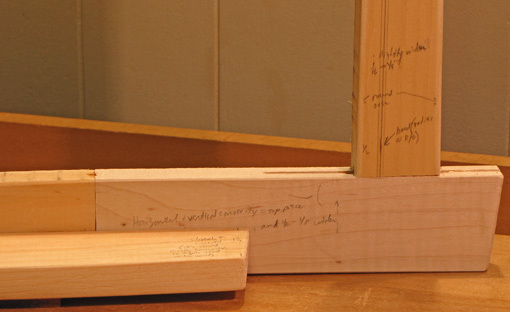 Sensitivity to the wood is essential to creating compelling, personal woodwork. I believe that one reason that a lot of the furniture that comes from non-woodworker design “experts” looks lifeless is that the wood is just “filled in,” like a color of paint. Unlike stone, clay, glass, or metal, wood carries the exciting variety of biology for us to behold and use! Practically, this requires that we understand and account for its properties, quirks, and even its mysteries. 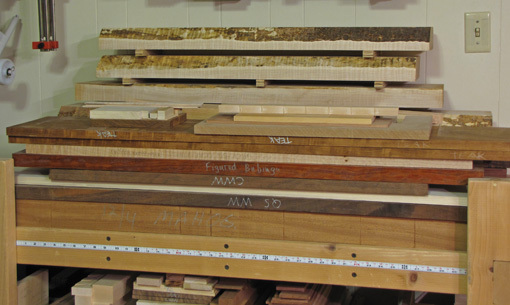 The differences in choosing, for example, butternut versus bubinga will affect almost every aspect of a piece. Understanding Wood by Bruce Hoadley. 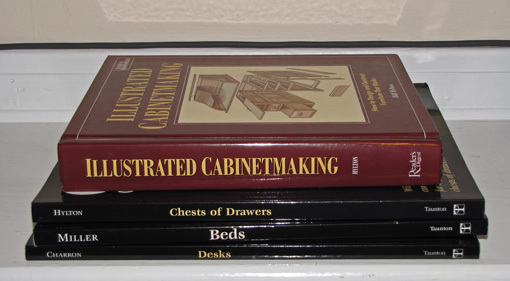 If there is any one “must have” book for woodworkers, this is it. 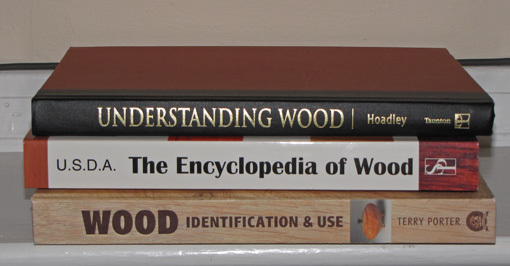 Wood Handbook/Encyclopedia of Wood from the Forest Products Laboratory. All 486 pages are available as a free pdf here. Click on “View” under “Wood handbook – All Chapters” for the 13.90 MB download. Also available from Lee Valley in printed form. Wood by Terry Porter. A beautiful compendium of pictures and descriptions of woods to whet your appetite. FPL Tech sheets Look on the right side of the page for “Wood Properties (Techsheets).” Very helpful data such as wood movement values for many species . Paul Hinds’ unbelievable website with a gazillion pictures of a zillion species of wood. Purdue Cooperative Extension site Select “Hardwood Lumber and Veneer Species” from the drop down list. Practical monographs on domestic species with helpful pictures showing the range of quality and figure within each species. Most important, you’ve got to get your hands on the particular wood you are planning to use, see how it works, moves, finishes, and watch and live with it a little while before using it in the project. For the mirror, the example piece for this series of posts, I wanted a densely figured wood that would look good in narrow widths. I held up some pieces next to the bathroom mirror: maple, other light woods, and walnut, just didn’t give the look I wanted. The reddish color and swirly figure of waterfall bubinga were hits. I had false started with some figured makore only to find that I seemed to be sensitive to the dust and I wasn’t as fond of the figure as I first thought. I also had to junk one of the pieces of bubinga that had some stresses in it. That’s wood for you. I love this stuff. Next in the series: Researching the design and techniques. The concept is important because it will be a guiding, unifying vision throughout the rest of the design and building processes. It defines a piece: its look, mood, style, and aesthetic. 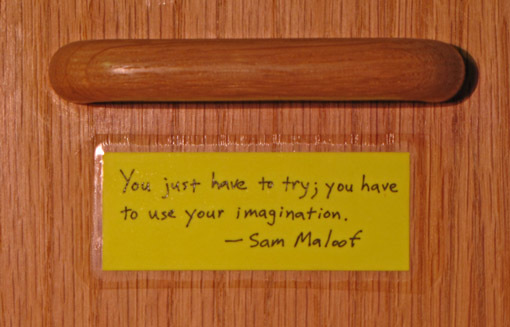 It sustains you when doubts arise deep into making a project. The concept is a bit like a person you understand, trust, and love. For most of us, highly skilled and exact drawings are not necessary to represent a concept. What matters is to have enough sketches, graphite or electrons, and a mental sense, to make the concept clear to you. Every detail need not be worked out at this point. Rather, the clarity of the concept is a reference that promotes consistency when deciding later which nuances fit or fight the look of the piece. 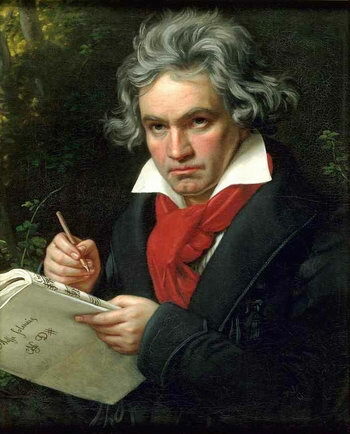 Like a song, there will usually be a “hook” – an aspect that draws keen interest within the unity of the piece. The concept need not be grand; a modest, simple theme sharply conveyed with conviction can be quite powerful. There must be a good sense of the size and overall proportions of the piece. For the wall mirror, the example piece in this series, I wanted a Japanese motif, most significantly with curves contrasting with straight lines and angles. No mitered corners. The top of the frame was the hook for me. The straight line, trapezoidal sides lead the eye up to it. As I experimented with different shapes at the ends of the top piece, it was easy to pick the winner. The straight lines and angles of the bottom piece form a visually solid base. I later reworked the end angles. Later I experimented with adding a little shelf. I envisioned the surfaces of the top and bottom pieces to be convex in the horizontal and vertical dimensions but I could not draw that. No problem – I worked it out later with a mock-up. I experimented with size and proportions using a medicine cabinet at home and some masking tape. I was not sure of every detail and dimension at this point, nor was everything on paper, but I was sure about the essential look of the piece. I emphasize the need to have a concept! 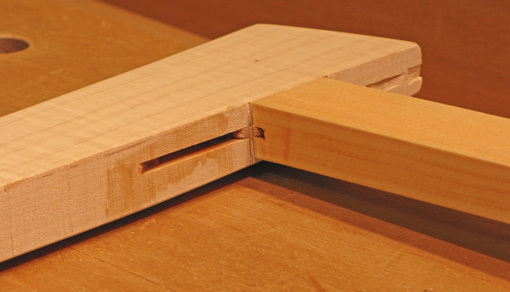 Some woodworking projects reflect the lack of a unifying, clear vision on the part of the maker. Features foreign to each other may be conglomerated or there may be no focus of interest, no reason for the viewer to care. 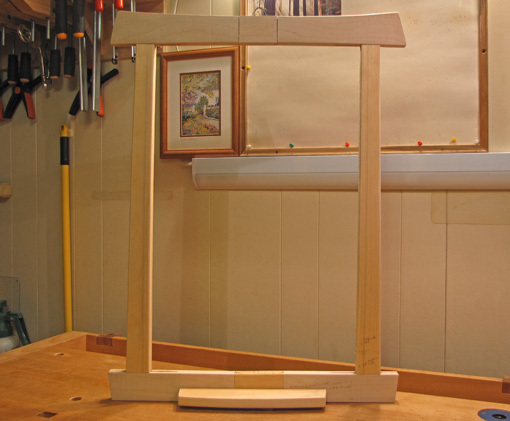 Sure, we’re woodworkers and we all make pure utilitarian stuff too – I sure do – but if you want to make fine woodwork that excites and fulfills, develop a good concept to get you going.